Wang, J., Zhang, L. and Guo, H. (2015). Arabidopsis Leaf Explant Culture. Bio-protocol 5(22): e1654. DOI: 10.21769/BioProtoc.1654. In this protocol, Arabidopsis leaf explant culture is described using an adaptation of a previous method (Hu et al., 2000). 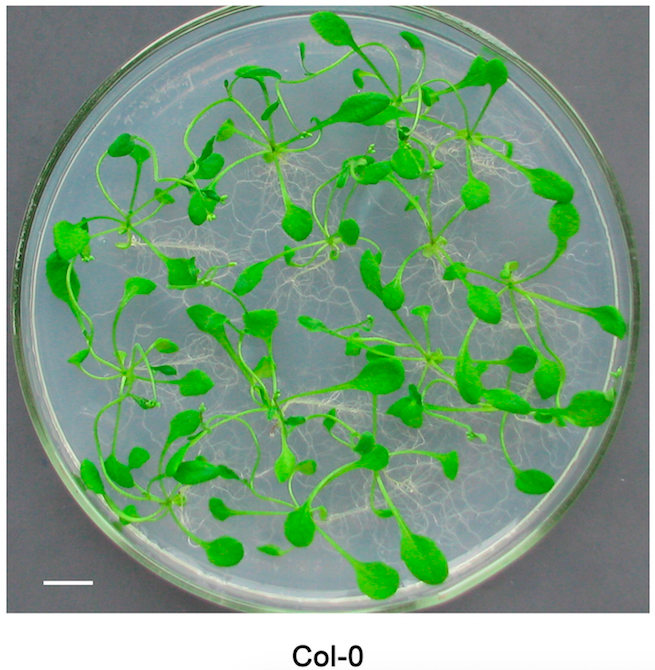 Cells from the cut edges of leaf explant are able to proliferate and subsequently form calli on the callus induction medium, in which is supplemented with 2,4-D and 6-benzyl aminopurine [6-BA]. 2,4-D, one of the artificial auxin, is able to promote cell mitosis at low concentration. 6-BA, the first generation of synthetic cytokinin, plays an important role in plant cell division. 2,4-D in combination with 6-BA can effectively induce callus formation (Rashmi and Trivedi, 2014). The aim of this protocol is to analyze cell division competence of Arabidopsis plants with different genotypes. This protocol can be modified and applied to culture explants from other types of plant tissues, such as root and stem. Prepare the Murashige & Skoog (MS) solid medium. Autoclave the Murashige & Skoog (MS) solid medium and pour it into Petri dishes when the temperature of the bottle reaches 50 °C. Put the Arabidopsis seeds in the 30% 84 bleach for 10 min for sterilization. Discard the bleach and wash the seeds with sterilized water for three times. Place 10~15 sterilized Arabidopsis seeds onto each Petri dish with the MS solid medium, and seal the Petri dishes with parafilm to keep sterile and moist. Store the Petri dishes in darkness at 4 °C for 2 to 4 d for vernalization. Transfer the Petri dishes to Arabidopsis growth chamber at 22 °C under a long-day condition (16 h light/8 h dark). Culture the Arabidopsis plants for about 2 to 3 weeks until the width of leaves reaches 3-5 mm (Figure 1). Figure 1. Arabidopsis plants culturing on the MS solid medium for 3 weeks. Bar = 1 cm. Prepare and autoclave the MS solid medium. Add 100 µl of 1 mg/L 2,4-D and 1 mg/L 6-BA into the MS solid medium, named callus induction medium, when the temperature of the bottle reaches 50 °C. Ensure that the performance is done in a flow cabinet. Pour the callus induction medium into Petri dishes. Ensure that the performance is done in a flow cabinet. Ensure that all the performances from steps C11-13 are done in the flow cabinet. Cut across the leaf and midvein with sterilized scissors to yield small strips, which are about 5 mm in length and 2 mm in width, including the midvein going across the width. Ensure that similar mature rosette leaves are selected for the experiments. Select leaf strips in similar size and transfer them to the same callus induction medium with sterilized tweezers (Figure 2). Figure 2. Arabidopsis leaf strips. Bar = 3 mm. Seal the Petri dishes with parafilm to keep sterile and moist. Store the Petri dishes at 22 °C in darkness for 1 to 2 weeks. Observe the calli and take photographs (Figure 3). Figure 3. Callus growth in leaf explants (Wang and Guo, 2015). Callus growth in leaf explants of Col-0, 35S-miR159847 transgenic (lines 8), iaa28-ko mutant, and 35S-IAA28-1 and PCsVMV-IAA28m transgenic plants. The explants were photographed on day 7 without changing the medium. Bar = 2 mm. This protocol was developed from the following published paper: Hu et al. (2000). This research was supported by the Ministry of Science and Technology (Grant2014CB138402). Hu, Y., Bao, F. and Li, J. (2000). Promotive effect of brassinosteroids on cell division involves a distinct CycD3-induction pathway in Arabidopsis. Plant J 24(5): 693-701. Rashmi, R. and Trivedi, M. P. (2014). Effect of various growth hormone concentration and combination on callus induction, nature of callus and callogenic response of Nerium odorum. Appl Biochem Biotechnol 172(5): 2562-2570. Wang, J. J. and Guo, H. S. (2015). Cleavage of INDOLE-3-ACETIC ACID INDUCIBLE28 mRNA by microRNA847 upregulates auxin signaling to modulate cell proliferation and lateral organ growth in Arabidopsis. Plant Cell 27(3): 574-590. How to cite: Wang, J., Zhang, L. and Guo, H. (2015). Arabidopsis Leaf Explant Culture. Bio-protocol 5(22): e1654. DOI: 10.21769/BioProtoc.1654.